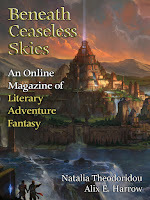 "Do Not Look Back, My Lion," by Alix E. Harrow [bio] (edited by Scott H. Andrews), appeared in Beneath Ceaseless Skies issue 270, published on January 24, 2019. Pro: It’s an interesting setting: a world with two suns where the women are stronger than the men, and where a woman takes both male and female husbands. It’s a message story, and it makes a strong case for how cruel war is, and how cruel to force it on people who don’t want it. Con: There’s too little to this story beyond the message. Eefa has almost no agency in it; for the most part she just watches helplessly while things happen. She doesn’t even plan her own escape at the end.